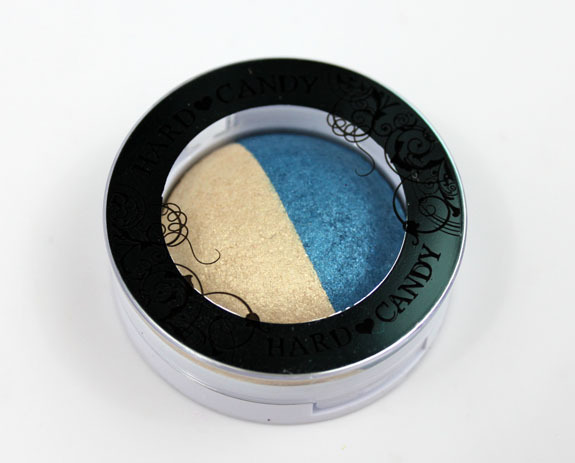 Hard Candy Kal-eye-descope Baked Eyeshadow Duo’s are shadows which are baked on a terracotta disk and you can use them either wet or dry. They come in fourteen different color combos. Backstage Pass is a really nice combination of colors. 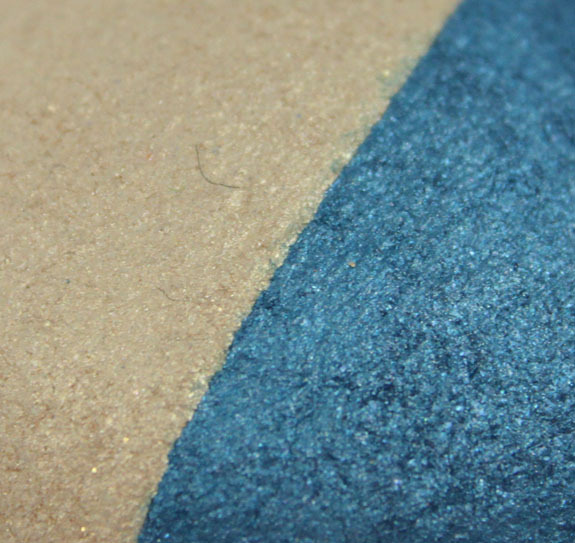 One side is a pale shimmery vanilla and the other is a medium shimmery swimming pool blue. 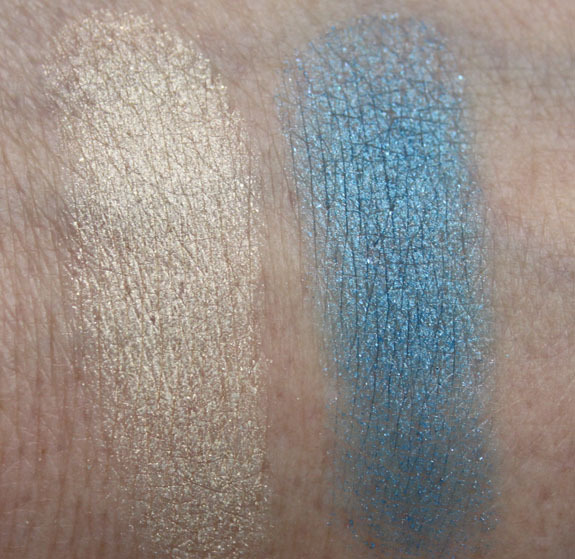 When you us the shadows dry they do give you a pretty decent pigmentation. They appear more shimmery and definitely have more fallout. When you use them wet you get more of a metallic finish and of course, not as much fallout. The colors look more intense. You can also use them as a liner this way since they are more intense. The shadows don’t feel as soft as some other baked shadows I have felt (MAC) but they are still pretty nice. Have you tried these yet? What is your opinion of baked eyeshadows in general? Especially for the price, I think this is a great value. Pretty and wearable colors. 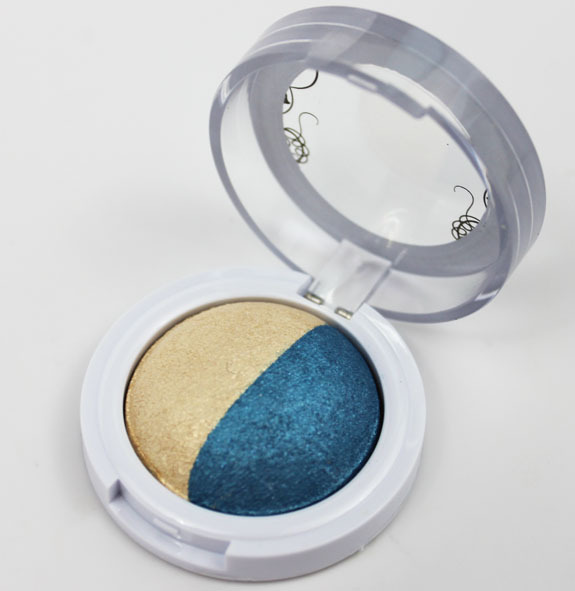 I had bought one of these duos a while ago and it had horrible pigmentation–this one is much better. It was black & white, not sure of the name though. I’m going to have to remember this one next time I head to train wreck known as Walmart’s beauty section. They look really nice wet. I have a h.c. duo in rush hour. It’s a pinkish coral and a warm toned brown. Dry the pigmentation is so-so but still buildable anyways and wet theyre really nice! I like using these on lazy days when I don’t feel like putting a look together from my extensive collection..I think they’re worth the money. Unfortunately my walmart hasn’t been restocking they’re h.c. inventory lately! bummer! Do you have any other colors? This is the only duo one that I have from them as of yet. 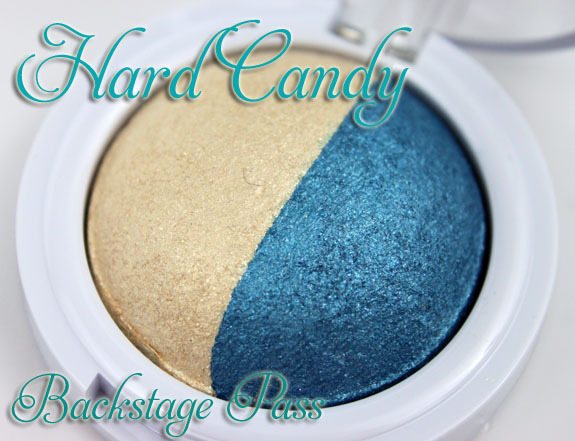 I have yet to try Hard Candy…I want to though! This is a pretty silly question, but when you use eyeshadow wet, do you get the brush or the shadow itself wet? Obviously I don’t wear eye makeup often, haha. 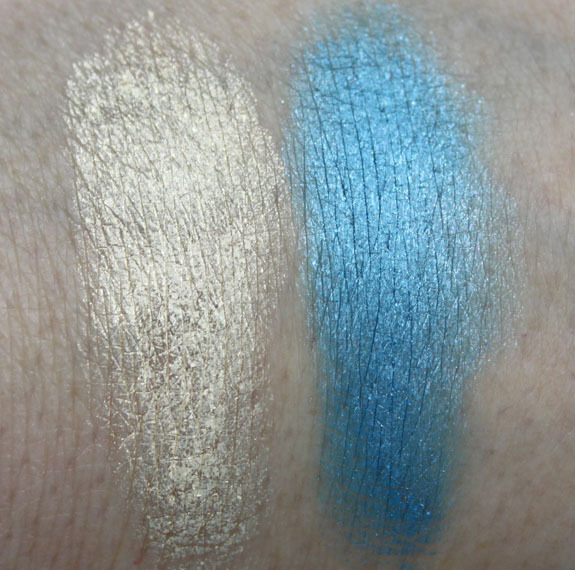 I’m getting pretty tempted by all the swatches on here, though – so pretty! LOL i was just thinking about asking the same thing… also, do you just wet with water, or use a specific medium/solvent? thanks so much for your time! Speaking for myself alone, when I do a wet eyeshadow I usually stick my brush in warm tap water and blot it then brush it over the pigment/shadow I want to use. I use tap water, and like D’Anna said, dip a brush in the water then onto one small corner of the pigment/shadow.